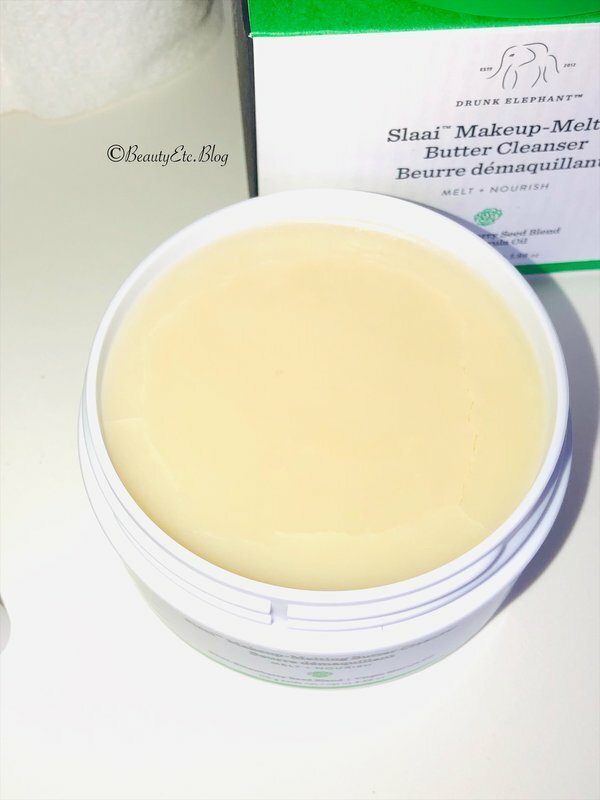 Drunk Elephant Slaai Makeup Butter Cleanser Review — Beauty and Etc. Slaai is defined as a salad and is also the name of Drunk Elephant’s NEW Makeup-Melting Butter Cleanser. The new cleanser is some what of a fruit salad blend made with fruit extracts (blueberry, kiwi, and strawberry) and replenishing fruit oils. I was a bit surprised by this launch as Drunk Elephant promotes their Beste No.9 Jelly Cleanser the most. But due to the change in skincare trends and needs, they felt a need for a cleansing balm to their collection. As someone one who wears minimal make-up on most days (mascara, sunscreen, gloss- sometimes concealer and bronzer), I’m interested to see how this cleanser will work in relation to my micellar water along with my gel and cream cleansers. Please note this product was kindly gifted to me by the brand, but the review is based on my honest thoughts through multiple uses of the product. The Slaai cleanser is designed to melt away makeup while nourishing your skin in the process. The cleanser is also able to remove dirt, sunscreen and water resistant makeup formulas. Slaai is made with a blend of African oils along with fruit oils. The cleanser also comes with a mini of The Bamboo Booster, which is a charcoal bamboo blend that is finely milled to provide physical exfoliation. TIP: The booster can also be applied to the lips for exfoliation as well. Packaging: The cleanser comes in a white and green jar. The top is magnetic and had a spoon/spatula attached. I love that this comes with a spoon. The spoon helps to ensure that you’re scooping out the correct amount of product- not too little or too much. Also the spoon attachment will eliminate your fingers from being placed directly into the product, which could cause contamination. -Optional: One to two times per week, add Bamboo Booster™ to Slaai™ for a customized, skin-refining physical exfoliation to aid in the removal of dead skin cells that have accumulated on the surface overnight. -On dry skin, use dry fingertips to massage Slaai™ over face and eyes. -Add water to activate, rinse well with warm water, and pat dry. -May also be removed with a soft, damp cloth. As with the majority of Drunk Elephant products, the shelf life is listed as 12 months. Ethylhexyl palmitate, is a derivative of palm oil often used as an organic replacement to silicone. It has a 'dry-slip' feel that is very similar to silicone's texture. It is found in many skin care products as an ingredient used to adjust the consistency. Palm oil is also a natural source of vitamins A, C, and E, which also have antioxidant properties. Caprylic/Capric Triglycerides, A mixed triester derived from coconut oil and glycerin. It comes in the form of an oily liquid, and is sometimes mistakenly referred to as fractionated coconut oil. Caprylic mainly works as an emollient, dispersing agent and solvent. Safflower Seed Oil- known to be beneficial to the skin as it’s high in vitamin E, contains omega-6 fatty acids, slows down the appearance of aging and helps to maintain moisture and balance. Lauryl Laurate- (is synthesized from lauryl alcohol and lauric acid) Plant based emollient used as a skin conditioning agent, binder, emulsifier. It’s also found in foundation, sunscreen and lip balm among other products. Polyglyceryl-3 Laurate- is a conditioning Agent - Emollient; Surfactant - Emulsifying Agent that is determined to be safe for use in cosmetics. What it does not contain: Suspicious 6 ingredients such essential oils, silicones, fragrance, and PEGs. Irritant-free. Gluten-free. The first day I received the Slaai Cleanser I used it alone. Prior to using it I had my a long list of face products along with a sleeping mask on my face. I wanted to try the cleanser alone to get a feel for the product alone. Extra : I opted to not use the Bamboo Booster as the directions clearly stated if using retinol to proceed with caution using the two together. I’m particularly happy this was mentioned as I use retinol several times a week and retinol alone can be harsh on the skin. I used the attached spatula to scoop out a spoonful of the cleanser. I applied the balm cleanser to dry skin and gently worked it into my skin. I was happy to see that the smallest spoonful was able to be distributed all over my entire face. I rubbed the balm into my dry skin with dry hands for about 30 seconds and it quickly turned into an oil. After I added water the formula emulsified into a consistency similar to a cleansing milk. I noticed that the cleanser does not lather or foam. After removing the cleanser, I did not proceed to use any other cleanser. Once my face completely dried it did not feel dry or tight. I completed my regular skincare (picture below) and my face felt the same as it usually would. The results of using the Slaai cleansing balm was smooth and balanced skin (not dry and not oily). I used the Slaai Cleanser to remove heavy coats of mascara. I typically apply a lash primer along with 2 coats of mascara. Removing mascara is always a challenge for me with a regular micellar water and cleansers. I was eager to see if the Slaai cleanser could remove my mascara alone. I applied a little of the cleansing balm to my finger tips and gently massaged it into my lashes. The balm quickly transformed from a balm to a an oil. Within seconds the cleansers broke down the mascara beautifully! I’m happy to say this passed the test! I did not experience any sensitivity or burning to my eyes from the cleanser. The Slaai and Bamboo Booster together provides a nice level of exfoliation. I don’t think it’s too harsh or too gentle. I also don’t think it’s something that should be used daily. I like that the Bamboo Booster can easily be added to the cleansing balm. This eliminates the need to grab another full size product like a face scrub. I had a few questions before I initially started using the cleanser. From my understanding, most cleansing balms require the usage of a second cleanser afterwards. I was wondering if the Slaai cleanser could be used alone to break down sunscreen or if I would need to follow-up with a second cleanser? For myself and the amount of make-up and skincare products that I use daily, I found that the balm provided a sufficient enough cleaning for me to use it alone. Perhaps, if you wear a lot of make-up or have acne prone skin, you may want to follow-up with an additional cleanser. The packaging can be quite bulky. That may be my only regarding the packaging and the product. The container is a little too bulky to keep in my medicine cabinet. The past couple of days it’s been shuffling between a shelf in my shower and my sink countertop. As for the rest of the packaging, I love that it comes with a magnetic lid and spoon. As I previously mentioned, the fact that a spoon/spatula magnetically attaches, you don’t have to worry about it getting lost and having to stick your fingers into the container. As for the Bamboo Booster, I do agree with the directions that only a small amount is needed for physical exfoliation. I found that the physical exfoliator provided a pretty good level of exfoliation. I didn’t find the physical exfoliation to be too abrasive or too weak. For someone who is not used to physical exfoliation, this is something that you could use twice a week. Personally, I prefer to use a physical exfoliator only once a week. I do wonder if Drunk Elephant will sell the Bamboo Booster alone or if this is something that will be sold solely with the Slaai cleanser? I’ve heard that this tiny vial is supposed to provide up to 80 uses. I think the Bamboo Booster sold alone would be a great addition to the Drunk Elephant skincare line as they currently only sell chemical exfoilators. Chemical Exfoliation is great, but sometimes you just need a physical exfoliator to quickly remove dead skin. I guess this is something that we will have to wait out to see if it’s released alone. A little of the Slaai cleanser goes a long way. This is a factor that I think about when spending over $30 on a cleansing product. 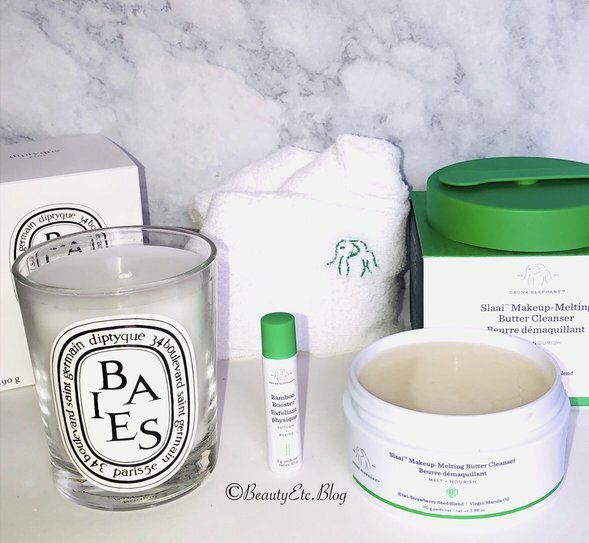 You may have seen a picture floating around the internet where the price per ounce is broken down for Drunk Elephant Slaai cleanser along with many other cleansing balms. The Slaai cleanser is one of the lesser expensive in comparison to other mid-range cleansers. The Slaai cleanser breaks down to be $8.76 an ounce. Overall, I really enjoy the cleansing balm and how conditioned my face felt after each use. I do prefer to only use one cleanser when washing my face. I’m not one of those people that double cleanse daily. I know this is not routine that works for everyone, but it works for me. Slaai was able to breakdown my 2-3 coats of heavy mascara in the matter of seconds without me having to tug on my lashes. I like that I am able to use the cleanser alone and I did not feel the need to double cleanse afterwards. For me its a one and done cleanser- which makes it a winner for me. Random question of the blog- Where do you store your balm cleansers? By your sink, vanity or in the shower? Will you be purchasing the new Slaai Cleanser? Let me know either way!! !